Canoeing is one of the fastest growing water sports around. It gets you outdoors, enjoying nature and the elements and at the same time is a wonderful form of exercise that helps your arms, back and shoulders. It’s an activity that can be done by young or old and even has a fascinating history behind it for those interested in the cultural significance. But one thing that most people agree on is that getting dipped (or rolling) can really ruin your outing. Most people expect to get a little wet, but on colder days, it can really be not only uncomfortable, but also potentially dangerous. Whether you’re trying to stay dry or even want added safety for learning, making a DIY canoe stabilizer is a worthwhile project that may be easier to do than you think. Although there are many stabilizers on the market, the basic principle works the same. An outrigger unit is attached to either one or both sides of the canoe. When the canoe tilts, the stabilizer will push into the water preventing further tilt. One-sided stabilizers provide extra weight on the side opposite to the tilt which makes rolling less likely. Outriggers have literally been used for thousands of years and we’ve yet to find anything more simple and effective at keeping boats of all descriptions upright. One of the most popular types of stabilizer is the “adjustable boom” stabilizer. It usually has a styrofoam outrigger with adjustable aluminum booms which allows you to set them out further (or closer) depending on your needs or local conditions. Another type is “width-increase flotation”. These are traditionally just add-ons that make the base of the canoe wider, giving extra stability. They are really only suitable for when you’re fishing from the canoe as they make it more difficult to get your speed up and “cut-through” the water. The advantage of this type is that you can almost use anything to add that extra ballast as long as it’s a floatable material. Why Would You Want a Canoe Stabilizer? There are three main reasons why you might want to have canoe stabilizers. Safety. If you are new to canoeing (or have children that you want to teach safely), attaching stabilizers will give you a chance to focus on paddling and steering without the worry of getting drenched or starting off with “eskimo rolls”. Also, on almost any type of water body, you’re going to encounter adverse weather conditions at some point; the more stability you have, the safer you’re going to be. Even if you’re an old-hand at canoeing, there’ll be times when extra balance can mean the difference between getting wet and getting home safely. Utility. Canoes aren’t just for heading off to the rapids. Many people use their canoes for fishing on lakes or even just lazing in the sun. As with any small boat, you’re going to get quite a bit of rolling from the waves or wind, having stabilizers will lessen the roll and allow you to remain pretty stationary while fishing or relaxing. Less movement will stop the fish getting scared and make a more productive day, too. Storage. Canoes are the perfect way to head out into the wilds and enjoy a few days camping and fishing, but canoes can be quite limited in terms of space. So unless you enjoy having a large backpack hoisted over your shoulders for hours at a time, some extra storage space can be really handy. You may not have quite the maneuverability of a standard canoe, but the extra space afforded by being able to strap bags or tents to the booms will be a real plus. Ready to Go: Most store bought stabilizers literally just need to be clipped (or clamped) into place and are ready to be used. Quality Materials: No matter where you buy your stabilizer, they are likely to be held to a certain standard in terms of the materials used and the quality of production. This can really provide peace of mind. Professional Advice: When making your own stabilizer, you’ll have to do a fair amount of measuring and calculation to ensure that you’re getting the maximum possible balance in the safest possible manner. Buying from a store means that the sales clerk will be able to assist you in getting the right size and type for your specific needs. Personalization: Although getting a stabilizer from the store will give you access to advice, the advice is likely to be general and based on nothing more than the particular model of canoe that you own. The advice won’t have anything to do with your particular style of canoeing or your body type. For example, if you happen to be quite tall, you may have a problem with over-balancing on a thin base canoe. If you make your own stabilizer, you can correct for this in the planning stage. Price & Flexibility: The price of stabilizers is certainly getting cheaper, but if you want different types of stabilizers for different purposes, the price can soon mount up. By making your own, you can save money, recycle things from around the house and most importantly, you can adjust them (either to a different style or different measurements) without too much difficulty. Pride in an Accomplishment: When we make something ourselves, we take more pride in it and will ultimately appreciate its usage a lot more. The actual act of creation gives you a better understanding of how your creation works (which can help with adjustments) and you’ll find that you can make interesting adjustments as you perfect your stabilizer. In this article, we’ll show you three of the more popular methods of making a canoe stabilizer yourself. They have all been tried and tested and involve techniques that (obviously with different materials) have been in use for hundreds of years or more. They all have their advantages and disadvantages and of course and you may be better with one type of craftsmanship than the other. This is a good solid outrigger that not only provides balance, but is easy to make and attach. It uses C clamps to attach to the canoe which can easily be removed when you want to transport it. Firstly, begin by prepping your wood and getting your tools ready. Place the canoe in the water and weigh it down as much as you can. Measure how far the distance is from the top edge of the canoe to the water line. This is measurement 1. Next cut your two by fours to measurement 1. The next part is to actually cut your outriggers. Get 2 x 3ft lengths of two by fours. Shape one end of this into a point and sand one side down so it will be smooth and glide through the water. Now you need a horizontal support; this should be cut to the width of the canoe and add 4ft. To put together your horizontal support, use the aluminum stud braces to connect your vertical supports on the underside of the horizontal support. With the smooth sides facing down, you can use more stud braces to attach the outriggers to the horizontal supports. In a well ventilated area (preferably outside), paint or varnish the outrigger assembly. Make sure that you get all of the edges to make sure your frame is fully waterproofed. You can use the C clamps to attach the frame to your canoe. Make sure they are securely fastened (you can remove them fairly easily when transporting). This is a super lightweight outrigger that can be made by almost anyone with some basic tools and a bit of time and effort. The PVC piping is light but strong and flexible so it will provide balance whilst being good for overall control whilst canoeing. Several long pieces of ½ inch PVC piping. End caps for PVC piping. Cut a piece of 7ft PVC piping. Using the PVC glue, add glue to both ends and attach two PVC elbows. Make sure they are secure and of course facing the same direction. Into each of the PVC elbows place and secure two pieces of 6-inch PVC pipe. Next, you should glue the T-fittings to the bottom of the open ends of the 6 inch parts. Make sure they are perpendicular to the 7ft piece. From your foam bundle, safely cut 2 large pieces of foam. These can be any reasonable size depending on your needs. If you are more concerned about resting safely and still on a lake, make bigger pieces. For general reference, the larger the foam, the more stable the canoe, but a piece 6ft long and about 1ft in height and width should be more than enough. This part can be a little tricky. Use a spike or a well strapped knife to cut a hole length-ways through the foam (through the whole 6ft) about 1 1/2 inches in diameter. Make one more hole through the centre of the foam piece (on the length side) that intersects with the other hole (making a T shape). Insert a PVC T-fitting into the final hole you made (before you put it in place, cover the insides with glue). Slide a 3ft piece of PVC piping into each side of the foam, it should secure with the glue you just applied. Attach the other ends of the 3ft pieces to your outrigger frame. The whole piece can now be fitted to your canoe’s yoke simply by using the Velcro one wrap. This is the outdoor hobbyist method. Although it may not last forever, building a stabilizer from discarded materials can be really rewarding. Not only that, it also has a very back-to-basics cool look whilst still performing its function. Start by cutting your long branches into four x 6ft pieces. Setting two of these pieces 6ft apart make a large “H” shape. Secure the shape using your string or binding material. With your next 6ft piece, thread the handles of the plastic containers through it. They should be evenly spaced and remember that the more volume you can fit onto the “bar”, the more balance you’re going to have. To provide extra support, cut a couple of pieces that you can attach diagonally from the top of the “H” (where your containers are) to the middle of the “H”. This should give you a fairly stable structure. Take the whole thing and strap it to the side of your canoe using more binding. You should note that although this will work great for a while, it is not good for a permanent solution as the bindings will come loose over time. 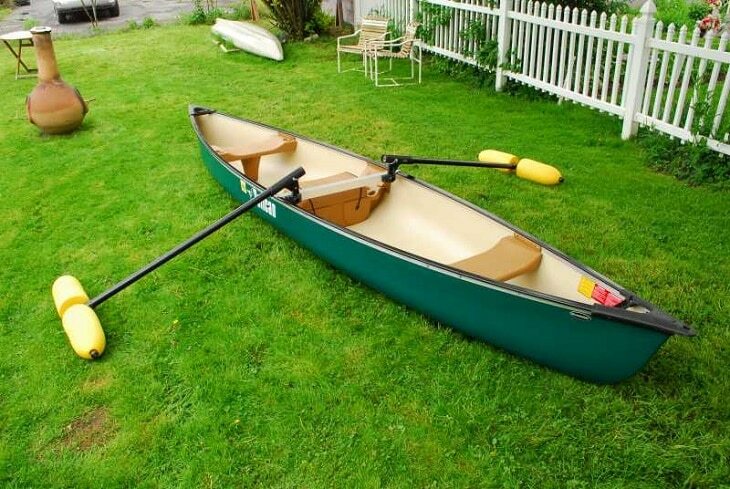 Making a basic outrigger or stabilizer for your canoe expands your possibilities for usage. You can turn what is essentially an ancient form of transport into something that can be used for many other purposes. For the top solo canoe you can use, see our comprehensive reviews to find out more. It’s fun and not too difficult to do and can even be a great family project. Although adding a stabilizer adds safety to your canoe, you should always wear a life vest (especially if you’re taking kids out on the water). The basic principles for most do-it-yourself canoe stabilizers are the same, so have fun and experiment. If you’ve made your own stabilizer before, or want to chat with other guests about tips and tricks, feel free to leave a message in the comments section below. See more tips on DIY camping gear to make you look like a professional in our earlier article.